13.07.2013. | Our generation of MPH graduates 2012/13 just finished their last exam. We are all happy and wish them to defend their master thesis this year with full success! Center School of Public Health and Health Management, as department of Faculty of Medicine at University of Belgrade, from its foundation is active member of ASPHER. Two days visit of APSHER delegation is started on May 09, 2013. The main objective of the visit is discussion about actual status and potential development of public health education at school, with focus on Master of Public Health. Short information and basic criteria available for download. 08.05.2013. | ASPHER Deans' and Directors' Retreat 2013 will take place in Maastricht, May 23/24th with a possible social programme on Saturday, the 25th..
Click here to download the agenda. You are encouraged to become ASPHER community at the same page. 04.05.2011. | ASPHER Deans' and Directors' Retreat 2011 will take place in Belgrade, 25-28 May. Click here to download the agenda of this year's retreat. Click here to download the first announcement. For the agenda of the Young Researchers Forum 2010, click here. The Young Researchers Forum 2010 took place on Wednesday 10 November in Amsterdam prior to the 3rd European Public Health Conference. Best oral and poster presenters received prizes generously funded by Swiss School of Public Health+ (SSPH+) and EHESP School of Public Health, see below for details. Furthermore, all authors selected for the oral presentations at the forum had their registration fees for the regular programme of the conference covered by ASPHER. Photos: (top) Dr Elspeth Anwar - winner of the best oral presentation award; (bottom) Participants of this year's event and members of the jury (Prof. H Brand, Prof. F Paccaud, Prof. A Flahault, Prof. V Bjegovic-Mikanovic, Prof. T Tulchinsky). 20.09.2010. | The process of admission of students for the MPH Programme 2010/2011 is just started, and will be finished between October 04 and October 08, 2010. The minimum number of students is 22, while the maximum is 36. Please, read more about this Programme, which is fully accredited during the 4th cycle of National accreditation done by National Educational Council of Serbia. 18.09.2010. | One day Workshop “ASPHER Public Health Core Competencies Programme”, will take place on October 22, from 10.00 to 18.00, at the premises of the Institute of Public Health of Serbia (Batut), Dr Subotica 5, 11000 Belgrade. The Workshop is organised on behalf of ASPHER and hosted by the Institute of Public Health of Serbia with support from the Centre School of Public Health (Faculty of Medicine, Belgrade University). The discussion about competencies has gained momentum not only in North America and Europe, but worldwide. Therefore many public health professionals are highly interested to harmonise the various efforts in this field. Furthermore during the last years it became clear that the public health competencies usually acquired at Schools of Public Health have to be related to public health performance. The aim of this workshop is to support and further develop the dialogue between, on one side public health professionals, decision makers and managers and, on the other side, schools of public health with regard to necessary competencies. This dialogue should support professionals to develop, organise, implement, carry out and evaluate public health interventions which are relevant for meeting present and future challenges to European populations’ health. Read more. 27.04.2010. | Call for application for external PhD fellows at INTHEALTH, CAPHRI, University of Maastricht. The Department of International Health (INTHEALTH) is the coordinating centre of the Public Health Research Network for Southeast Europe (PHR-Net). Through this call, INTHEALTH invites candidates from Southeast European (SEE) countries (namely Albania, Bosnia and Herzegovina, Bulgaria, Croatia, Kosovo, Macedonia, Montenegro, Romania, Serbia and Slovenia) to apply for 5 (five) external PhD positions at the School for Public Health and Primary Care (CAPHRI), Maastricht University, The Netherlands. The aim of this call is to offer research possibilities, which would ultimately materialize in PhD defences, to talented and motivated SEE public health professionals who can not leave their countries for work or family reasons, but nevertheless wish to combine work, research and public health practice. This philosophy is in line with the mission and vision of the PHR-Net which, through the support of Maastricht University, is seeking for effective and efficient solutions for reconstructing and strengthening public health research capacities in SEE countries. Click here for more information. ASPHER. 26.04.2010. | 3rd European Public Health Conference - Call for abstract submission. It is our pleasure to once again invite you to the next 3rd European Public Health Conference, taking place this year in Amsterdam, Netherlands from 10 to 13 November 2010. The organisers are the European Public Health Association (EUPHA) and the Association of Schools of Public Health in the European Region (ASPHER), together with the Netherlands Public Health Federation (NPHF) as co-organiser. You are all invited to submit your abstracts via the following website. 19.04.2010. | Today, at Teaching Scientific Board of the Medical Faculty University of Belgrade, the Centre School of Public Health has changed its name to be the Centre School of Public Health and Management. This change is inspired with the EU Project activities related to health management education and devoted to further developemtn of this functional Centre of the Medical Faculty. 13.04.2010. | Health Education and Promotion at Maastricht University, The Netherlands Health Education and Promotion is a one-year graduate master’s course within the master’s programme Public health offered by the Faculty of Health, Medicine and Life Sciences. The course provides students with a high level of academic knowledge and skills enabling them to analyse the behaviour and environmental factors that threaten or facilitate health and to design and evaluate interventions aimed at health improvements. The programme is intended for students who aspire to a career in health education and promotion and prospective public health officers and healthcare workers in research-oriented, policy-making or public affairs jobs where health education and promotion is deemed important. For more visit ASPHER. 08.04.2010. 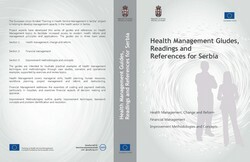 | New book: Health Systems Governance in Europe. The Role of EU Law and Policy. This book, a co-publication by the OSE and the European Observatory on Health Systems and Policies, was funded by the Belgian federal health authorities (SPF Santé Publique) and the National Institute for Health and Disability Insurance (NIHDI/INAMI). It offers a state of the art of academic discussion on a number of current and emerging governance issues in EU healthcare policy, including regulatory, legal, ‘new governance’ and policy-making dynamics. The study looks into different areas of EU policy and law-making that have an impact on national healthcare systems. It provides policy-makers with a compelling and rigorous analysis of the real and potential impacts of EU integration on the organisation of healthcare provision and the protection of public health, highlighting the need to balance economic and social imperatives. The editors: Elias Mossialos, Govin Permanand, Rita Baeten, Tamara K. Hervey. 29.03.2010. | The Second Congress of Social Medicine of Serbia with International Participation: “Challenges of the Social Medicine in the 21st Century”, June 09 – June 12, 2010, Zlatibor. This Conference is organized with joint efforts of the Secsion for the Social Medicine of the Serbian Physicians’ Society and relevant institutions in Serbia dealing with social medicine and public health within academic and practical public health areas.